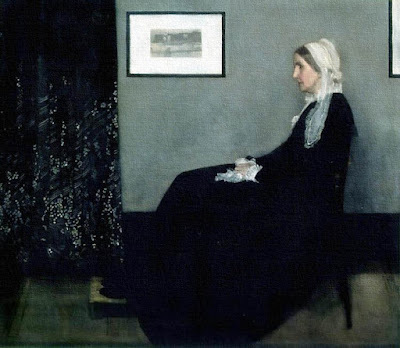 My mom requested that I write on Unforgiven: with deepest gratitude for passing her love of movies onto me, for all the lessons she has taught me and for her constant encouragement, I dedicate this post with love, affection and prayers, to my mother. Thanks, mom! Clint Eastwood's 1992 film Unforgiven was memorable not only because it taught viewers about bounties, misfiring guns, and the slight differences between outlaws and sheriffs, but also because it painted some of the most memorable visions of Biblical lessons to ever grace the big screen. The movie, like so many on this blogspot, is more complex than I can fully explore here, however, we will examine some important points. We initially learn that Bill Munny (Clint Eastwood) had been married to Antonia Feathers; she is the most important character in the film, because she enables us to view Bill from within: she is not a real woman, rather, a mirror so we know instantly about his spiritual state. "Antonia" means "worthy of praise," and her last name, "Feathers," represents the Holy Spirit. Because the Holy Spirit descended upon Christ at His Baptism in the form of a Dove, using a bird to suggest the Holy Spirit is a staple among artists. That the last name is "Feathers," suggests that Bill's love of God was only "feathers deep" and not a genuine conversion that could stand the trials of temptations.﻿ His own name verifies this: "Bill," as in a dollar, and "Munny" as in "Money." We learn at the end of the film that he became a merchant who "prospered in dry goods," and the description "dry" refers to the lack of Grace in his life (usually represented by water as in Baptism). ﻿﻿﻿When the "Schofield Kid" (Jamie Woolvett) arrives at Bill's farm and proposes going after the bounty, Bill's son, William Munny Jr (Shane Meier) says, "Pig's got the fever," which references Bill himself, because as soon as the Kid suggests they should go after this bounty, Bill is slipping back into his old ways, the pig representing his "animal" appetites for money and the "fever" is his sickness of not being strong enough to resist the temptation (he nearly dies later in the film and that, too, represents death in the life of grace and the "rebirth" of Bill the assassin). Bill justifies going after the bounty on that basis that he's worried about his kids' future, but providing them with an example of being hired by prostitutes to kill a couple of men is itself an example of prostitution; that his son is named after him guarantees that his son will grow to be like his father because his father didn't note "the lilies in the field, who were dressed more gloriously than Solomon in all his splendor," and seeks to provide for his children in worldly, rather than spiritual, wealth. There is another justification which Bill proposes: "Just this one killing." The problem is, when he had been a killer for hire earlier in his life, he was drinking, but now his destination is Big Whiskey, and by the name, we know that Bill's reasoning doesn't matter, he is going to drink and drink deeply of (not just Whiskey but) Big Whiskey and that's going to lead to a lot more than just one killing. Bill stops to get his old time partner, Ned Logan (Morgan Freeman). While Ned originally turns down the offer, when he steps through the hallway of his house, we see his rifle hanging above his head, like a comic strip "thought bubble" and know that Ned is thinking of killing those cowboys. This is going to sound rather ridiculous, however, let's listen to how this sounds: "Bill and Ned." Saying those two names reminds me of that silly film, Bill and Ted's Excellent Adventure which was released just three years earlier in 1989. 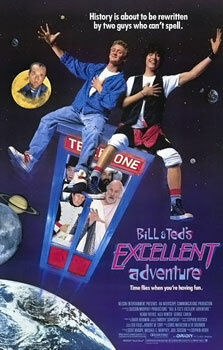 If we place the two films side by side, Bill and Ted go back in time collecting famous people like Socrates, Napoleon, and Billy the Kid, Bill and Ned go back in time in their partnership to collect a bounty from a group of prostitutes. Further, Ted (Keanu Reeves) and Ned (Morgan Freeman) both share the last name, "Logan." Lastly, just as Bill and Ted are "rewriting" history, in Unforgiven, W.W. Beauchamp (Saul Rubinek) re-writes the history of the Old West from what the real gunslingers tell him and what he sees for himself. Of course, it's the films of Clint Eastwood that have largely shaped our understanding of what the Old West was. "History is about to be re-written by two guys who can't spell." stories of bad cowboys and the lousy morals of sheriffs. The incident starting the whole series of events is the "cutting" of a prostitute by two "customers." Delilah is a prostitute and, with the obvious Biblical reference to her name, we have to consider that as a further illustration of the lessons to be learned from Unforgiven. In the Old Testament, Delilah accepts payment to turn over Samson to the Philistines, all she has to do is find the source of his strength. In Unforgiven, instead of Delilah cutting off Samson's hair, the "Samson" cowboy cuts Delilah's face, thereby undoing her beauty and her ability, in this particular situation, to earn an income by prostituting herself; whereas Samson is given strength again by God to bring down the pillars to destroy the enemies of Israel, the "whore's gold" brings down the feeble pillars of justice to kill many innocent men. 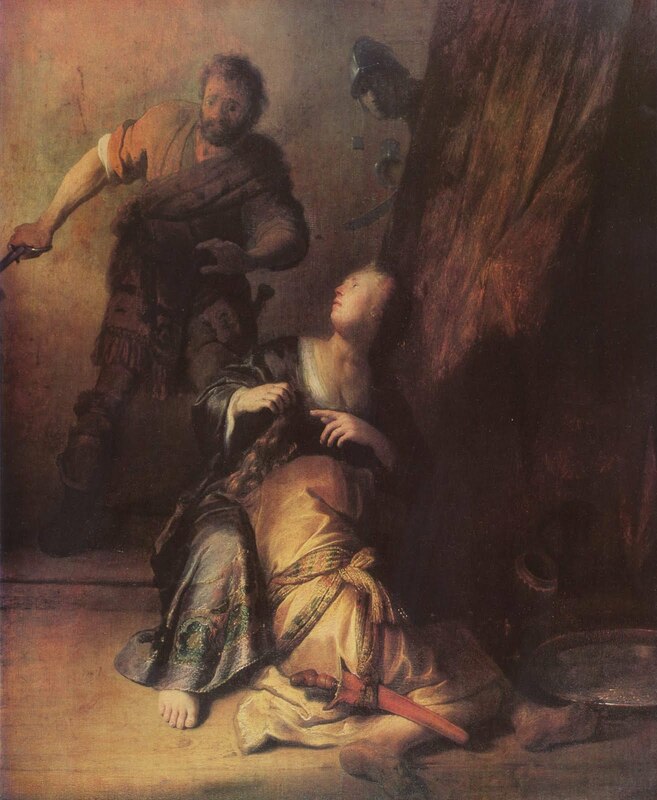 Samson and Delilah by Rembrandt, 1628, Berlin. The two cowboys responsible for the crime are going to be whipped and Strawberry Alice (Frances Fisher) doesn't want that kind of justice: she feels that Delilah (Anna Levine) should get better than that. One of the cowboys offers Delilah a gift of his best horse, and this is one of the most important moments in the film, because it would turn the tide from Unforgiven to Forgivenfor herself as well, but Strawberry Alice steps in and prevents it. In the Gospel, a crowd brings a prostitute to Christ and demands justice according to the Mosaic Law that says a woman caught in adultery must be stoned to death, and Christ replies, "Let him who is without sin cast the first stone." In Unforgiven, Strawberry Alice and the other prostitutes invert the Mosaic Law and the prostitutes pick up stones and stone the cowboys. Why is justice so difficult to attain in this movie? Little Bill Daggert (Gene Hackman) is perhaps the most interesting character, not because he so easily crosses the line between the law he is bound to uphold and becoming a criminal enforcing the law (like his character Popeye Doyle in The French Connection) but because he tried to build a house, and the house is full of leaks. Symbolically, this illustrates the kind of justice that he enforces and doesn't enforce; the man with only one arm keeps saying of Little Bill, "He's no carpenter," and that clearly refers to The Carpenter, Jesus, because Little Bill can't build a house that keeps the water out, and in this case, it's the destructive waters of Noah's Flood that water represents, not Baptismal Grace. (For more on Justice, please see my post Amadeus: Confutadis Maledictus). Size is important in art, and that his name is "Little Bill," shows that he and Bill Munny are just alike, but Little Bill doesn't measure up to what is expected of him, namely, being a sheriff who can morally enforce justice. How many men does he kill? The Schofield Kid offers an excellent example for how symbolic the role of “eyesight” is for character development. Remember, it’s a character who can’t see who brought the message of the bounty to Bill and Ned, meaning that there was no foresight as to the consequences of what they are doing. The irony, of course, is that Kid wants to use his share of the bounty to get glasses, to improve his vision, but the better sight he gains is the wisdom to know “that he never wants to kill a man” again. Once you start, it's easy to keep going. In conclusion, Unforgiven represents how forgiving is a necessary part of justice: not forgiving perverts the law, and leads us to ignore real wounds, pursue false goals and forget our purpose in working on the salvation of our soul. All the events of the film happen because of Strawberry Alice’s self-righteousness in not seeing her own sins and seeing only the sins of another. All those men in the film died because of Strawberry Alice and her hardness of heart and, when we ourselves fail to forgive, something dies within us as well. Unforgiven demonstrates the power of art in illustrating the most basic, and important, lessons in life and why we should always follow them.